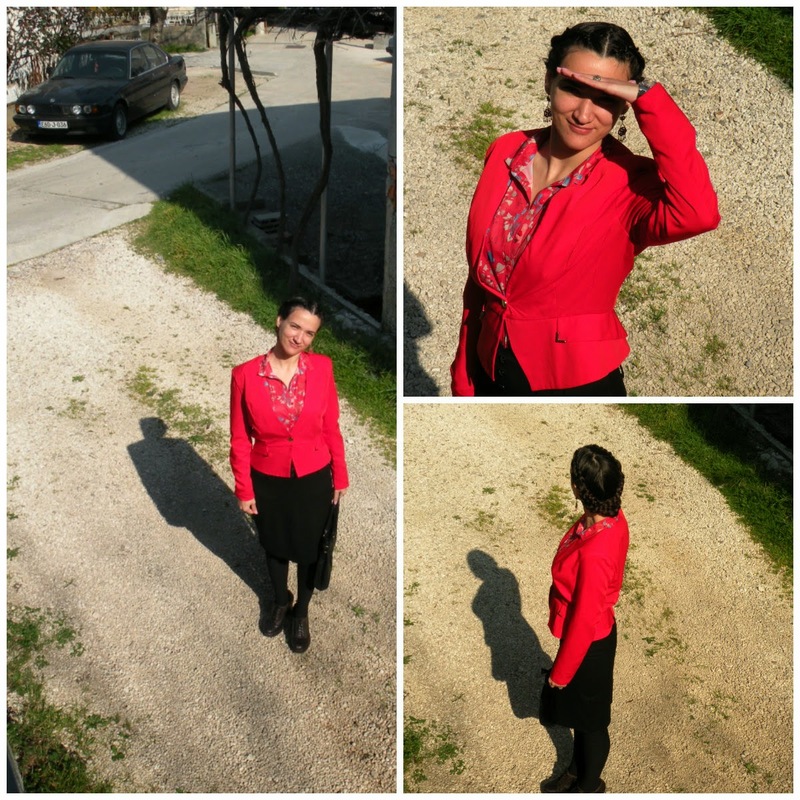 Red colour (if we are to believe Pamuk) feels fortunate to be red and I feel fortunate to be able to wear red. ( Do you know that wearing red was forbidden in the Middle Ages because they believed it to be the colour of the devil? How silly! It is the colour of love in all cultures) Moreover, I feel happy to have a copy of My Name is Red, a gift from my friends. Red is one of those colours I can never get tired of and this novel is one of those novel one can reread and find something new every time which is a sure sign of a work of literature. There is always place for a new interpretation....both of the novel and the colour by which it was named. Crvena boja (ako ćemo vjerovati Pamuku i njegovom romanu Zovem se crvena ) osjeća se sretnom što je crvena i ja se osjećam sretnom što mogu nositi crvenu. ( Znate da je crvena boja bila zabranjena u srednjem vijeku jer se smatrala vražjom bojom. Koja besmislica! To je boja ljubavi u svim kulturama). Nadalje, sretna sam jer imam primjerak romana Zovem se crvena, poklon od prijateljica...taj mi roman nikada ne može dosaditi, kao ni crvena boja...uvijek se tu može pronaći nešto novo, neko novo tumačenje...i boje...i romana. lovely look, you look great! Red does look great on you :D And how awsome is your hairdo? r: It makes perfect sense to me :) My hair always gets orange-ish on summer! Non conoscevo quel libro,malo voglio assolutamente leggere! Ache io adoro il rosso, e a te sta benissimo!!! omg your hair *x* so beautiful!!! Ti dona molto il rosso e che belli gli alberi in fiori! I love books of Orhan Pamuk and I definitely appreciate that you mention him in your post. I've got to say you look absolutely gorgeous in red, this color matches your strong side to my mind. How nicely you have done your hair as well! I simply fall in love with your hairdo, you look fabulous with those braids, dear Ivana! Wish you a blessed day ahead) Take care! i think i´m red too;) i just love you in red. you look breathtaking and your hair is sooo pretty too, i love that hairdo! Looks like you enjoy spring! Za Pamuka jedno <3 kao i za tebe :) Frizura ti je divna a crvena ti predivno ide uz ten tako da po mom mišljenju ne samo da ti voliš crvenu već i ona tebe! A tvoj outfit mi je super, trendy, a može proći i za poslovnu kombinaciju. hvala, to i je otprilike kako se oblačim za posao. Devo trovare quel libro! Mi piace la tua giacca! Devo trovare quel libro! Bella la tua giacca! I love the red. Brilliant look and you look awesome! red and black is always a good combo. this has something of a classic style. your black tights are ok, but i would maybe think about it to wear a skin-colored tights. Or some tone of a red colored tights. not too colourful, rather a little bit darker. With this combo you can use your skirt as "fashion-separator". black on your legs is mabye a little bit to much. but i can understand, why you prefer this colour on your legs. cause your handbag has the same colour. I like to wear black tights with black shoes....but in this case skin-coloured tights would also be a good choice. "I like to wear black tights with black shoes" - ah, ok. I dont know this so far.